Join us for a fantastic value golf holiday in the sunny Costa de la Luz, Spain at the 4-star Hotel Neuvo Portil Golf. This boutique hotel, in an up and coming resort, is only a short stroll away from the beach and offers impressive views of the Huelva coastline from many of its tees and fairways. Play golf with other Solos golfers! Come and join us on the sunny Costa de la Luz for a relaxed week of social, mixed golf. We will be staying at the Hotel Nuevo Portil Golf - a hotel which has received excellent reviews in recent times. Our boutique hotel has an intimate, friendly feel and is situated right on the Nuevo Portil Golf Course, where we will be playing our 5 rounds of golf – social team competitions which are based on Stableford scoring. A beautiful beach is just a short walk away, and the resorts of El Rompido, Punta Umbria and Huelva City are all close to hand. The hotel itself has a swimming pool and sun deck area – a great spot to relax after your round of golf. With spa treatments available and a choice of places to eat and drink, this hotel provides a great base for your golf week. Your holiday includes 5 rounds of golf on the Nuevo Portil Golf Course. This beautiful parkland golf course is characterised by wide fairways and fast, smooth greens. With gentle slopes and dog legs, the course provides a challenge for all standards of golfer. There are excellent views of the Huelva coastline to enjoy from many of the tees and fairways, with extensive sand dune beaches, the Atlantic Ocean and a forest of pine and junipers providing a fantastic backdrop for your round. It's an easy walking course, and the opening hole provides a challenge from the start; a tight par 5 ensures you concentrate on keeping your ball straight and if you manage that you still have to carry water to get onto the green. 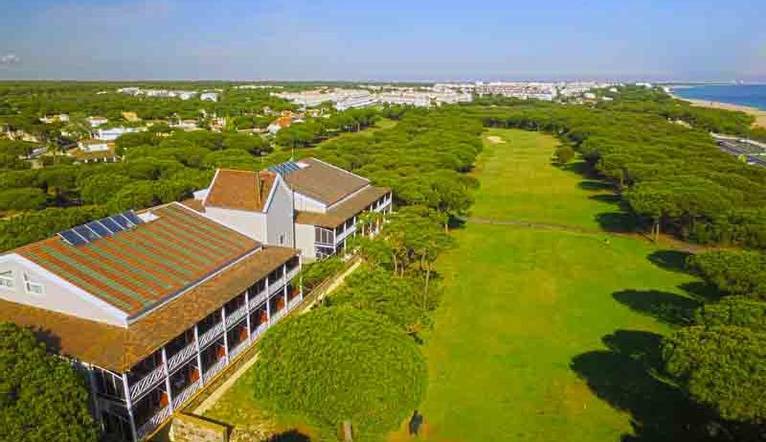 Hotel Nuevo Portil Golf is a colonial-style hotel with a beautiful location on the coast of Huelva and situated on the golf course itself. Facilities include an outdoor pool, gym, spa facilities, restaurant and bar area. The well appointed rooms feature satellite tv, telephone, hairdryer and air conditioning. WIFI is also available. The transfer time from Faro Airport to our hotel is approximately one hour and twenty minutes, depending on weather and traffic. Clients will most probably find that their golf clubs are covered on their household insurance policy. Most policies cover a single item such as golf clubs for a period out of the country. However, clients should make very sure that they do have cover. If not, Solos Holidays insurance includes cover for golf clubs and bag. We suggest a Group Collection to cover transfer drivers, and hotel staff of €15.00 per person. Your Tour Leader will collect this on your behalf and distribute it accordingly, thus relieving you of the burden of who, when and how much to tip. The tipping of housekeeping will be left to your individual discretion (a small amount left in your room on departure should cover this and would be much appreciated). As is customary, ‘the hat’ will be passed around for the driver and guide on all optional excursions. For any meals that are not included in your itinerary, or taxi fares, your Tour Leader can advise of an appropriate amount to add on.